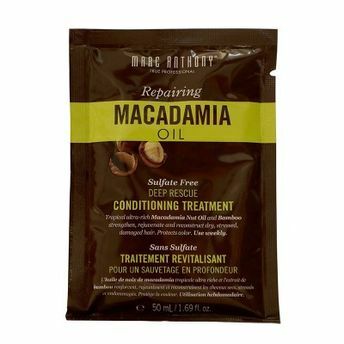 Strengthen, Rejuvenate & Reconstruct For Dry, Stressed & Damaged Hair Tropical Ultra-Rich Macadamia Nut Oil & Bamboo Sulfate Free Deep Healing & Protects Color Use Weekly Indulge your hair with this ultra-rich strengthening & reconstructing Sulfate Free, Deep Healing Weekly Conditioning Treatment. A unique blend of Tropical Macadamia Nut Oil penetrates the hair shaft for deep hydration. Bamboo Extract corrects, strengthens & boosts shine while restoring dry, dull, damaged, frizzy hair.